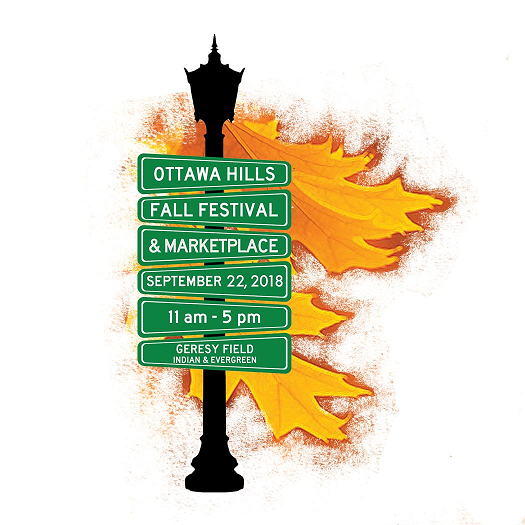 If you are looking for a fun day for the entire family, the 14th Annual Ottawa Hills Fall Festival, Marketplace and Auto Show is just around the corner! Bring the whole family and celebrate – rain or shine. Scheduled for Saturday, September 22 from 11:00 a.m. to 5:00 p.m., this year’s Festival includes an Art Fair & Marketplace that features a variety of original art, crafts, and other specialty items, live entertainment, pony rides, a pumpkin decorating contest and more. Back by popular demand, the 2018 Fall Festival Auto Show is sure to please all car lovers. The Auto Show staging begins at 9 AM, with judging at 3 PM. The auto entry fee is $20, with proceeds to benefit Impact Teen Drivers, promoting non-distracting drivers education curriculum at OHHS and beyond. Delicious food and beverages are also available. Located in front of Ottawa Hills High School (corner of Indian and Evergreen), the roads close and the hills come alive. The Fall Festival & Marketplace is FREE and open to the public. Support this year's Fall Festival by being a booth sponsor, patron or vendor. Festival sponsors and patrons will have their company and/or family name listed on signage the day of the Festival. For more information on supporting this event, please visit https://ohspa.membershiptoolkit.com/form/m/34244. For vendor information visit: https://ohspa.membershiptoolkit.com/form/m/50424. For more information and to register your car for the auto show, please visit: www.ohffautoshow.com.